If you experience ongoing pain in the muscles of your face or jaw, you might be suffering from a temporomandibular joint disorder, better known as TMD. Though it sounds a bit intimidating, TMD is a classification of symptoms that arise from problems with the muscles of the jaw or parts of the temporomandibular joint itself, as reported by WebMD. While an injury or blow to the face can certainly cause jaw or facial pain, there is not one specific cause for TMD. Rather, there are many potential causes, and variations of it based on age, gender and lifestyle. Direct injury to the face, neck or jaw. Grinding or clenching the teeth. This condition, known as Bruxism, puts heavy pressure on teeth, gum tissues and the jaw joint. Movement of the soft disc that is located in the jaw joint. Stress (which might cause individuals to clench or “brux” their teeth). While some individuals experience temporary bouts of pain and discomfort, others suffer continuously. Without question, pain in the face and jaw can affect one’s quality of life and make it difficult to eat or speak. Some report a tired feeling in the face, as well as hearing a grating or popping sound when opening and closing their mouth. Other cases list toothaches, headaches, neck aches and dizziness as common complaints. Because temporomandibular joint disorders are not well understood, diagnosis involves ruling out other potential disorders or conditions. For instance, if an individual is suffering from a toothache, he or she might have TMD. On the other hand, the toothache might be a symptom of tooth decay or a cavity. In the same way, facial pain could be caused by sinus problems. Thus, a thorough health history, including x-rays and a consideration of one’s oral health is essential. The good news regarding TMD is that there are treatments available, and dentists are fully equipped to help patients reduce their symptoms. Experience Jaw Pain and Facial Pain Relief At Alora Dentistry! If you’re suffering from jaw pain or facial pain, do not wait—call Alora Dentistry today. 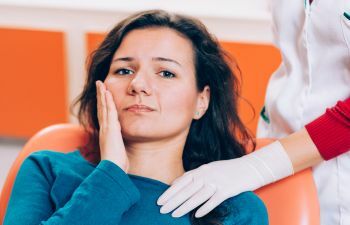 When it comes to treating pain conditions associated with TMD, neglecting your symptoms often leads to more pain and discomfort. Fortunately, our experienced and skilled TMD dentist is positioned to help you find relief.